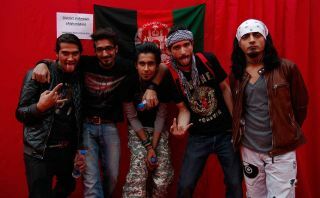 Rockabul, a documentary on the first Afghan metal band, will premiere in London this Sunday. It follows Afghan metallers District Unknown, as they form a band in an environment decimated by war, corruption and fanatical religious oppression. Footage of Kabul’s underground expat party scene in the mid-2000s is presented alongside evidence of the country’s conservative society, showing a nation in turmoil where the threat of violence is real for those who don’t conform. Rockabul was made by Australian photojournalist-turned-director Travis Beard, who mentored District Unknown, and was executive produced by Faith No More’s Bill Gould. The film and band were presented with the Global Metal award at Metal Hammer’s 2015 Golden Gods. The premiere will feature a Q&A with District Unknown singer Yosuf Ahad Shah. Rockabul’s UK premiere is on Sunday November 4 at 2.30pm, at Genesis Cinema in east London. Tickets cost £10.50 for adults, £8.00 for students/NHS workers and £5.50 for concessions, and are available now. For more information, visit the Rockabul website.